The Royal London Hospital is one of six hospitals owned and managed by the largest NHS Trust in the UK – Barts Health. The trust is one of Britain’s healthcare providers leading the way in improving patient experience. One of the strategies for making this a reality is funding a charity organisation, Vital Arts, to drive arts programmes that transform the hospital experience for all stakeholders. In their preparation to transform the Royal London’s interior, Vital Arts conducted a series of consultations with hospital staff and patients to choose fifteen designers and artists for the project. 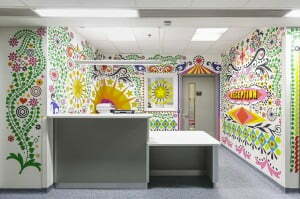 Each of them was given a specific area to decorate, including reception areas, play spaces, elevator lobbies, and various ward settings. To make the interior less intimidating for all, the artists had to consider multiple factors prior to creating a colour palette that would deliver the brief. 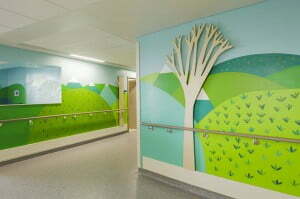 The idea of creating a world away from the ward is based on research proving the positive effect of environments that help reduce patient’s anxiety, both in children and adults. Those effects amount to an increase in patient’s appetite, better response to treatment, even pain relief. Textile artist Ella Doran who designed the bedside curtains with a panoramic view of the Thames confirmed the project’s success. “A seminal moment for me was when a three-year-old girl stopped crying the moment she saw the curtains, pointing excitedly to the hidden cats and rabbits. 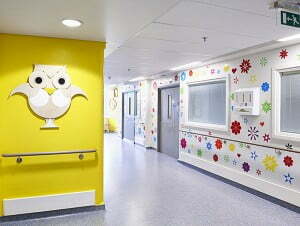 That’s when I knew my design had worked.” The Trust feel that the new interior helped in making the hospital less scary for kids, in addition to helping nurses bond and build trust with their small patients, which makes performing medical tasks much easier. This article is based on industry research and the official information surrounding the project.